This is the arena sport of the future! Program your tanks, then set them loose to destroy your enemies. Fire weapons, activate turrets and radar ... you can even make your tank self-destruct. Don't forget to defend yourself though as the last surviving command post wins the game! Players operate a team of four tanks, each controlled by a stack of command cards that form the tanks repeating program. The cards can order tanks to move, turn, fire weapons or use special equipment. Will you use a simple frontal assault wiht cannons and mortar - or a careful advance using targeting programs - or perhaps a confusing diversion using viruses and scanners ? Your tanks will repeat their original commands until you reprogram them .... so choose wisely. This game was originall published by Gamesmiths in 1992 and was out of print for several years. Fat Messiah reprinted it in 2001 - hurrah! 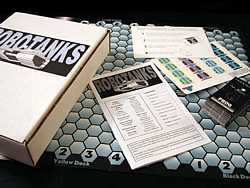 The game includes a rule book, a 17" x 22" colour map, 96 program cards and some tank cutouts.